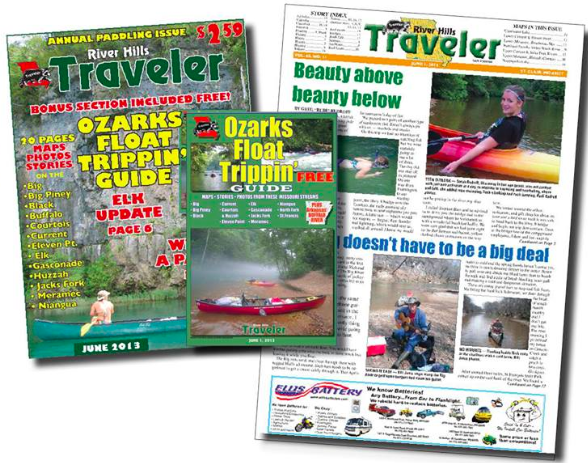 River Hills Traveler is a printed & digital publication offering stories from real Ozarks outdoors-people, tips & tricks, and recreation resources. River Hills Traveler, established in 1973, is your monthly guide to the Missouri outdoors. It is published monthly by Sexton Media Group and Midwest Times in Neosho, Missouri. Monthly magazine publications can be delivered to your doorstep (or in your inbox) concentrating on the Ozark outdoors - including all of Missouri, northern Arkansas and Southwest Illinois. If you like to fish, float, hunt, camp, hike, or just explore the backroads and backwoods of the Ozarks, River Hills Traveler is for you. All JRBP Individual & Family members and Business members receive a 25% discount on River Hills Traveler magazine subscriptions. Select printed publications that are mailed directly to your door, digital content access, or even give a subscription as a gift! Discount code emailed to you when you join on as a member today! 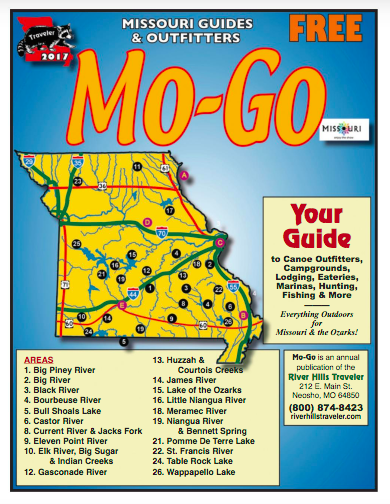 Your annual guide to Missouri canoe outfitters, campgrounds, lodging, eateries, marinas, hunting, fishing, and more! See maps and lots of points of interest.